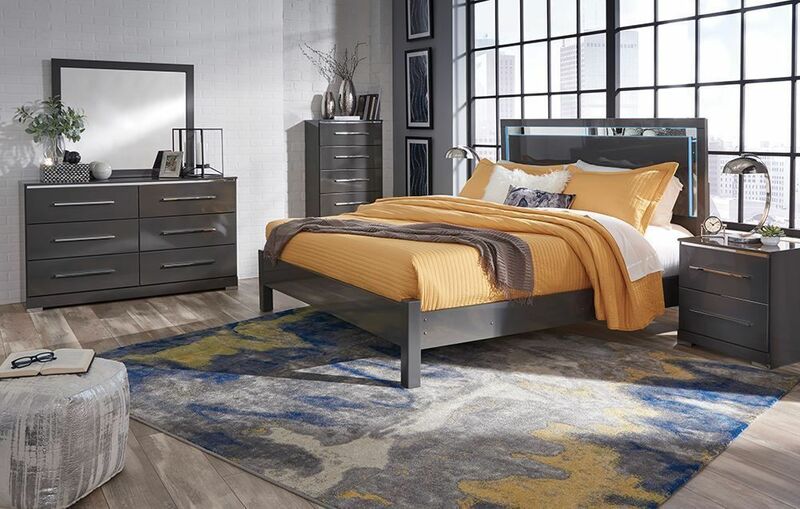 Light up your personal space with the Steelson California King Panel Bedroom Set! This contemporary collection is visually stunning, featuring ultra sleek lines, a gray high-gloss finish, and a floating effect given off by a strip of LED lighting. The dresser and nightstand's elongated drawers emphasize modern lines paired with chrome-tone branding and feet, while a discreetly placed USB charger ensures your devices will always be charged and close by. The ultimate look for a modern inspired retreat, this bedroom set exudes an upscale, chic appeal at a down-to-earth price. Light up your personal space with the Steelson California King Panel Bedroom Set! Set includes headboard, footboard, rails, nightstand, dresser, and mirror. Chest and ottoman pictured not included.